We are importers and dealers of 100% woolen hand-knotted Tibetan rugs made in Nepal. Each year we go to Kathmandu, Nepal where we hand-pick our rugs directly from the weavers. We have an excellent relationship with the weavers and pay fair wages so that everyone gets a good deal. 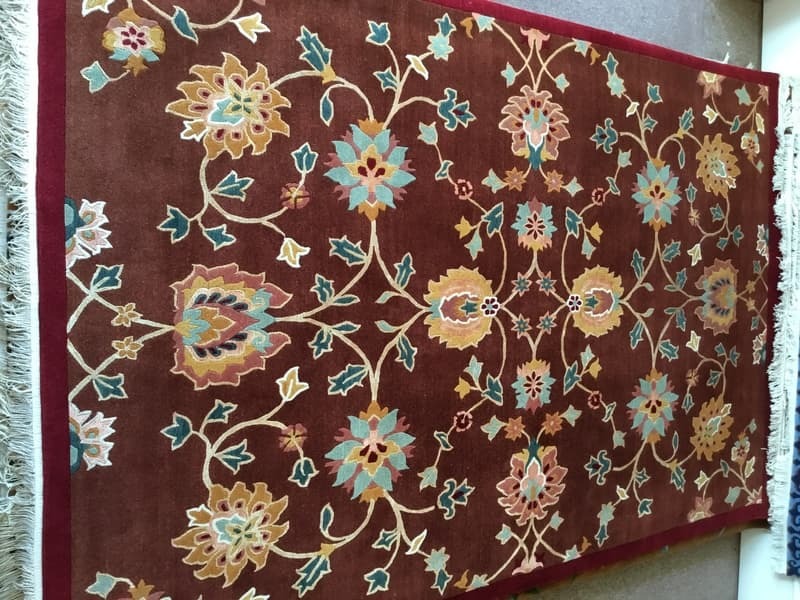 If you have any questions or comments about the rugs you see on our website, please contact us. We think you will find our rugs not only beautiful but also of the highest quality. We have unbeatable prices and our rugs last a lifetime! The Tibetans have been weaving rugs for centuries. In 1949, the Chinese took control of Tibet. When the cultural revolution of 1959 forced the Dalai Lama to flee from Tibet into India, many Tibetans began their exodus as well. Many found their new homes in Nepal. They arrived with nothing except what they could carry over the Himalayan Mountains. In order to sustain themselves, they began weaving rugs to sell. Since then, the rug industry in Nepal has expanded greatly, exporting rugs all over the world. 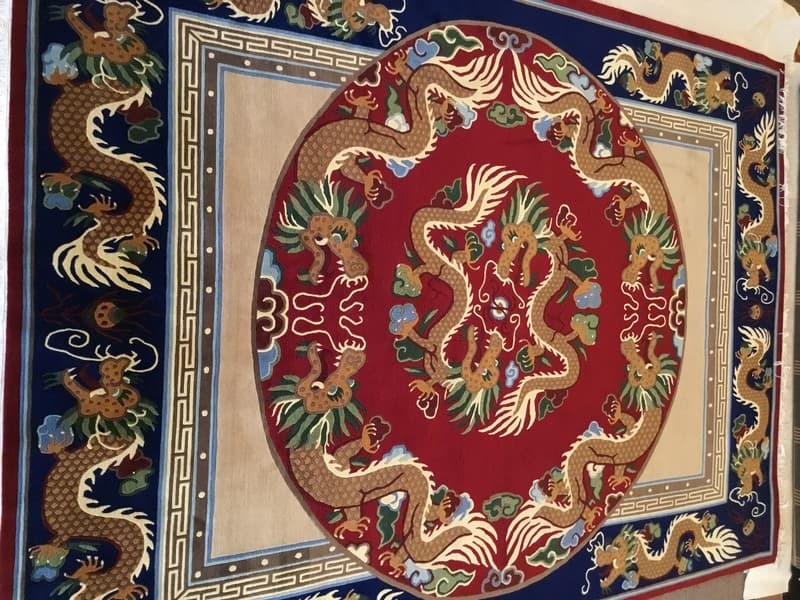 What Makes a Tibetan Rug so Special? The traditional Tibetan rug begins with wool from the sheep living high in the Himalayan Mountains. Their wool is soft and strong and has a high lanolin content that naturally repels stains. The rugs are woven on an upright loom using cotton warp and waft. The wool is hand-knotted to make a pile rug. Each knot is hand tied using more complicated weaving techniques than most other hand knotted rugs. The longer you walk on a Tibetan rug, the tighter the knots become, causing the rug to become better over time. Most rugs last as long as 80-100 years! The rugs are made using 60, 80 or 100 knots per square inch. The 60- and 80-knot rugs have a deeper pile and the 100-knot rugs are thinner with more elaborate design. All of our rugs are 100 knots per square inch . The traditional designs are quite varied, ranging from dragons and tigers to coin mandalas, florals, and stripes and crosses. Now, contemporary and modern designs are made as well. 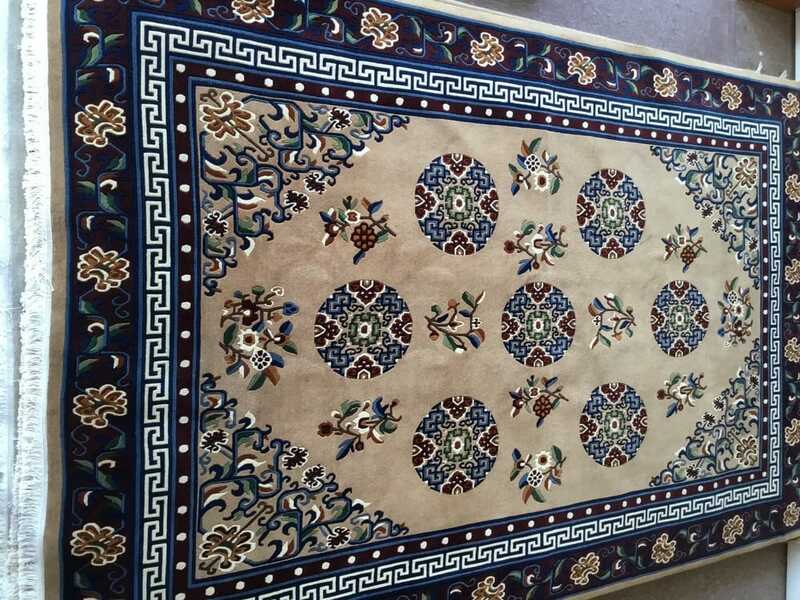 The variety of designs makes the Tibetan rugs of today appealing to a wide range of tastes. Mud, kids, dogs? NO PROBLEM! Our Tibetan rugs are made with colorfast Swiss dyes. The rugs can be washed with soap and water, and laid in the direct sun to dry. They can be vacuumed regularly. All these wonderful qualities make a Tibetan rug both beautiful and durable for years to come.